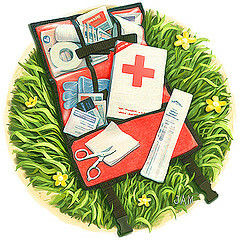 Why haven’t I mentioned first aid supplies yet? Simple…I only pack a few in my ESK. As to why, I prefer a fully paced medics bag. So, what do I put in the ESK? You will find Bandaids in varying sizes, Neosporin, Imodium AD, Musinex, antacids, along with various and sundry stainless steel surgical implements. Having a fully packed medics bag is something I highly recommend. Learn first aid. Take classes. You and your loved ones lives may depend on what you know.